The Omron GOsmart Pocket Pedometer with Activity Tracker (HJ-203BL) keeps a detailed analysis of the steps you take during the day, whether you're speed-walking to work or walking for exercise. Press the action button to separately record your workout time. Tracks steps, distance, calories, and fat grams. Other useful features include a clock, auto reset at midnight, and seven-day memory. Setup of the Pocket Pedometer is a now breeze ... simply enter your height and weight into the pedometer and let its auto-stride feature pinpoint your stride length. 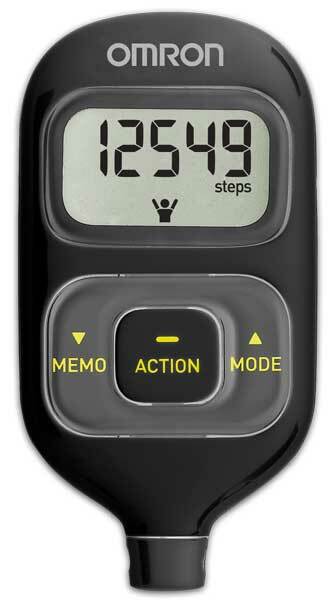 This sporty pedometer comes with an easy-to-understand instruction manual that walks you through setup, step by step. Large display buttons (memory, action, and mode) make for easy navigation. and the large digital display is easy to read.